For decades, the “Customer is King” mantra was a corporate recipe for success. While the banking industry is transitioning from a product-centric approach to a customer-centric one, customer centricity itself is being re-defined by emerging digital technologies. Customer Centricity 1.0 focused on the customer. But, now, empowered consumers are taking control of their financial and channel options as Customer Centricity 2.0 becomes the norm and individuals effectively manage their financial assets and data according to their requirements – anytime, anywhere, and on any device. With customers in mind, open banking and regulations, such as the EU’s revised Payment Services Directive (PSD2), forced banks to open their systems and data to spur competition and wider choices. The General Data Protection Regulation (GDPR) and proposed ePrivacy Regulation (ePR), which will cover electronic communications, align the different privacy rules that exist across EU member states. GDPR protects personal data, and the ePR will cover the confidentiality of electronic communications. In parallel, FinTech firms have leveraged their agility and technology innovation to transform both user experience and user interfaces. The front end of the payments value chain has undergone a rejuvenation process thanks to the entry of non-traditional players. Moreover, the penetration of smartphones – expected to account for a third of internet protocol traffic by 2021 – has added to the change. 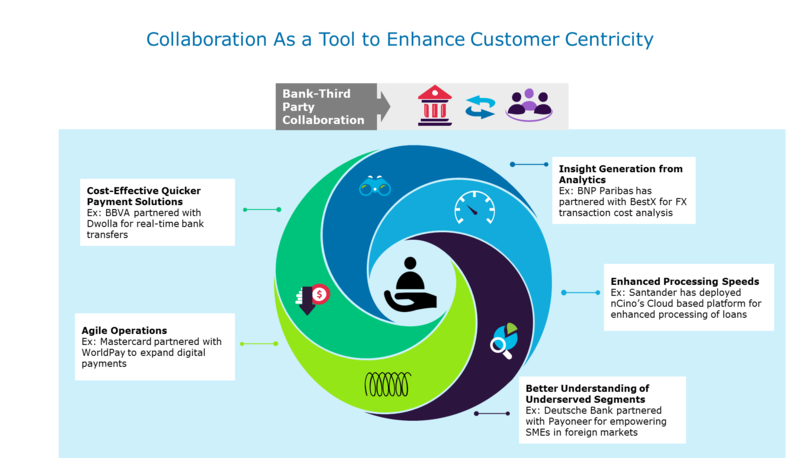 Now more than ever, effective collaboration with FinTechs is helping banks to better answer to customer needs and create higher customer stickiness. As established banks continue to explore customer-centric propositions and the use of APIs to enable data sharing, regulators are cognizant of potentially related issues these third-party-based services may generate. Sharing personal attributes with third-party websites after authorization with existing bank credentials. Several banks are collaborating with FinTechs and third-party payment service providers (PSPs) to offer a variety of customer-centric services today. Commerzbank-IDnow: Frankfurt-based Commerzbank wanted a mobile app for its banking services but could not authorize sign-ups outside a bank branch. Munich startup IDnow provided a solution that allowed Commerzbank to verify customers’ identity via video on their smartphone or computer. Fidor-CurrencyCloud: The customer accounts of German online bank Fidor are backed by an eWallet that provides ePayment features, except currency purchases, making payments, and checking balances in other currencies. London-based global payment platform CurrencyCloud provided a payment engine that was plugged into the existing infrastructure easily without additional costs. Bankia-Eurobit: Spanish bank, Bankia manages a large network of SMEs with cumbersome invoicing processes. Bankia implemented Eurobits’ invoicing platform that could be integrated with other ERP packages to benefit Bankia’s corporate clients significantly. BBVA-Atom: Multinational Spanish banking group BBVA increased its investment in UK digital bank Atom to improve its residential mortgage and lending business. BBVA has invested more than US$217 million for nearly 40% ownership of the popular mobile bank. Source: Capgemini Financial Services Analysis 2018. FinTech collaboration bolsters incumbents’ customer centricity by enabling cost-effective, quick payment services, enhancing processing speeds, understanding underserved business segments better, instilling agility into business operations, and by generating insights from analytics. Third-party collaboration will help established banks develop new experiences to fight the unbundling trend in financial services that can lead to customer attrition. Incumbents now realize the benefits offered by neo and challenger banks and are taking measures to revamp their mobile and digital strategies. Established banks are also leveraging platformification as a tool to orchestrate various services and provide bundled service offerings to clients. For example, Fidor offers its online platform to firms such as Spanish multinational telecommunications company Telefonica so it can offer customized services to clients. More collaborative initiatives are sure to follow in the months and years ahead as banks that leverage partnerships leap ahead of those that don’t. While 2017 and 2018 were the years of “Open Innovation,” 2019 should be the year of “Applied Innovation” with end customers benefiting from the effective collaboration between large players and startups. HuffPost, “Cisco: Enterprises Are Leading the Internet of Things Innovation,” Vala Afshar, August 28, 2017, https://www.huffingtonpost.com/entry/cisco-enterprises-are-leading-the-internet-of-things_us_59a41fcee4b0a62d0987b0c6. Currency Cloud website, “Clients: Making multi-currency eWallets possible with Fidor Bank”, https://www.currencycloud.com/company/case-study/making-multi-currency-ewallets-possible-fidor-bank, accessed January 2019. Bankia website, “Case Study: Eurobits-Bankia Collaboration,” https://www.bankia.com/recursos/doc/corporativo/20150429/casos-de-exito/case-studies-bankia-eurobits.pdf, accessed January 2019. BBVA, “BBVA backs UK banking disruptor Atom with further investment,” March 2018, https://www.bbva.com/en/bbva-backs-uk-banking-disruptor-atom-further-investment.